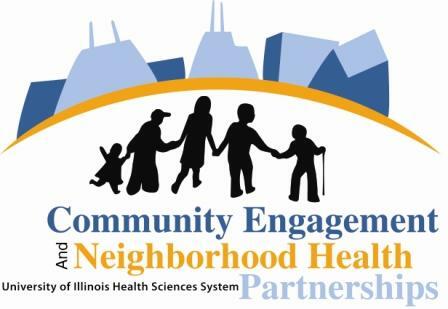 In the world of public health, researchers have learned that repeated reminders and layers of encouragement are most beneficial to have lasting impact on people’s behavior. It’s important that people see incentives not just at the gym, but at home, at work, at school, in worship, in restaurants, and in several other venues in order to continually encourage decisions that favor good health. 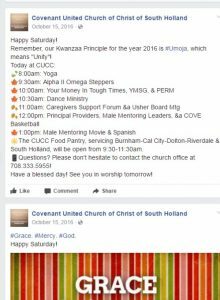 Covenant United Church of Christ in South Holland has experienced the same effect on their church-wide efforts – reminders from all dimensions. A health and wellness committee began to form under the guidance of Maude Baker, a nurse, who passed away about 5 years ago. “The committee began to get legs under her,” says Smith. She promoted blood pressure screening and diabetes screening. The church thought one of the best places to the screenings was during the annual Covenant UCC summer picnic. “This was 10 or 11 years ago,” says Rev. Smith. “We were intentional about serving turkey products, but other than that… we had rib tips, sugar drinks, all the fixings you’d expect at a BBQ. And on the one end, we’d be serving the food, and on the other end our health and wellness group was there doing their screenings. You’d be crazy to eat bad and have health and wellness on the other end of the table,” Smith says with a laugh. After the screenings, which were the initial steps enacted by the committee, one scary episode really put Covenant’s Health and Wellness Committee on track. “We had an incident one year, a few years ago,” says Smith. “An ambulance had to come to the picnic. A woman’s son was eating rib-tips under a tree, and passed out.” As it turned out, food wasn’t related to the episode. “The man wasn’t taking a certain medication he needed because it was too expensive,” says Smith, “but I felt complicit for serving rib tips. The church is guilty when we serve the kind of things that work against people’s health.” It was after the rib-tips episode that Covenant really changed their menu. After the “Alive” program, since so many health and wellness members got involved, it took the Health and Wellness Committee to the next level. “That spearheaded other things,” says Smith, “and forced the health & wellness to figure out if they were actually living their mission. Lastly, around that time the national leadership of the United Church of Church promoted an healthy eating initiative coinciding with First Lady Michelle Obama’s campaign, “Let’s Move,” focused on healthy eating and active living. 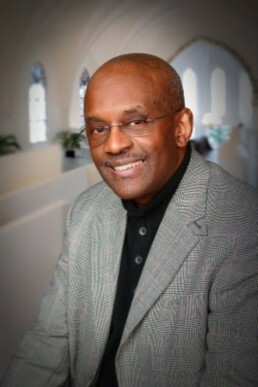 The UCC Chair for Domestic Policy, Rev. Barbara Baylor encouraged UCC congregations across the country to participate in the program in 2010. “When it was promoted by the denomination, we immediately changed our food offerings at church events…” says Smith. “We used to do ribs, sausage, burgers, all the fixings! You know the people kind of revolted at first, but they eventually fell in line. Some people bring their own food still, but overall the church is setting a healthy example. Covenant’s programs that support health range from yoga to mentoring to food assistance to caregiver support…and more. 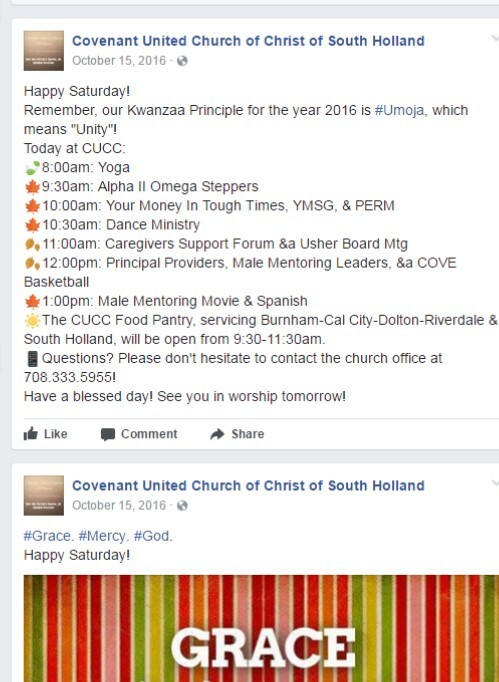 The ‘get healthy’ bug has now caught on to many groups in Covenant UCC. The group for older members, called Savvy Seniors, is finishing up a cookbook – the first of it’s kind. “I suspect they’ll be reasonably heart-healthy recipes,” says Smith. When they changed the menu, the church switched to only serving bottled water. “Now our green ministry told us about [the negative consequences of] using bottled water. Now I’m drinking water out of a Brita,” says a chagrined Smith. In addition, Covenant UCC’s Green Ministry has hosted film screenings on food topics. Last year the Green Ministry showed a movie on the food industry – Fed UP! – and then Health and Wellness followed up with “Soul Food Junkie,” a film about a young man who later became a physician. The church has offered space for yoga for over 21 years that meets every Saturday. The yoga group was in existence before Rev. Smith joined Covenant. It is led by a woman named Anita Cooper.